If you love playing games that use lots of dice, you probably need a way to carry those dice. 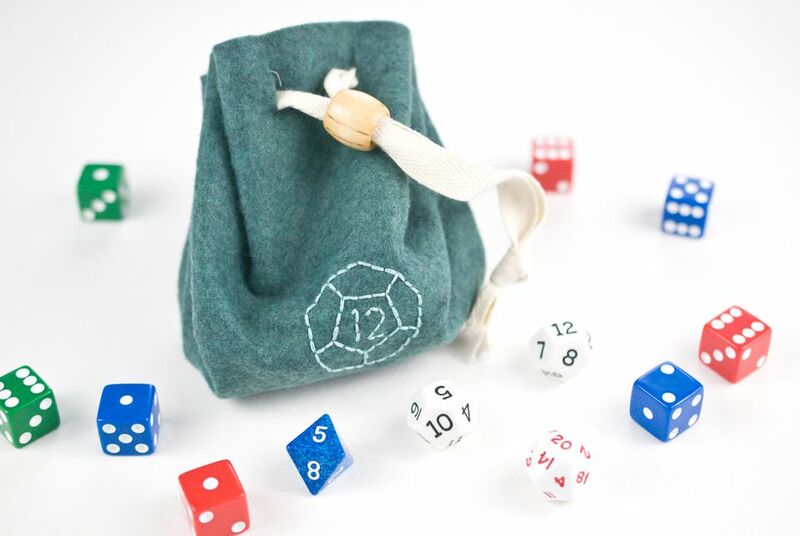 This easy DIY drawstring bag is perfect for holding your favorite game piece of chance, and you can customize it with embroidery of your favorite variety of dice! Similar to the embroidery project pouch (which would be perfect for holding several small games instead of stitching), you won't have to do any sewing! In fact, you could skip the embroidery so it's a project with zero stitches, but why do that when you can have a pouch with an embroidered die? Download the multi-sided dice embroidery pattern as a JPG and resize it as you wish. For the drawstring bag, you will most likely want to shrink the patterns some. They are given here at a large size so you can use them in a variety of other projects too. Cut an 11 to 12 inch circle from the felt and fabric. A large dinner plate makes an excellent template for this. Set aside the fabric circle. Choose one or more of the dice patterns and embroider it onto the felt circle using the tracing paper method for marking the pattern. Place the pattern so it is horizontally centered and about 1in above the center vertically. The embroidery in the sample uses three strands of floss and back stitch. After the embroidery is finished, carefully tear away the tracing paper. Pin the felt and fabric together with wrong sides facing. Place 12 pins evenly around the circle. Make a 1/2 inch to 5/8 inch mark between each pin. Each mark should be at least 1/4 inch from the edge. Place the pinned circle on a cutting mat and use a craft knife to cut a slit on each line. A sharp knife should have no trouble cutting through both layers. If you'd rather, you can fold the felt and fabric and cut the slits with scissors. Move the pins and cut 12 more slits between the first 12, so you have a total of 24 evenly spaced slits. Starting on the felt side, weave the twill tape or cording through the slits in the circles. Both of the circles should be held together as you do this. As you make your way around the circle, you will need to gather the edge of the bag together so the drawstring can go through all of the slits. There's no need to attach the fabric lining to the felt because the drawstring will hold it in place. Over time, the lining may fray some, but that adds to the charm of the bag. To finish off the drawstring, slide a large wooden bead over the two ends of the cording and tie the ends together with a large knot. This will prevent the bead from sliding off the end. Slide the bead toward the bag to hold the dice bag closed. You can use different patterns on a felt drawstring bag like this to use it for other purposes. You can also easily make a larger bag by simply starting with a larger circle. You may also want to make additional drawstring slits to help the bag close all the way.